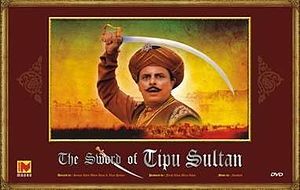 In episode 2 of Hindi TV Serial – The Sword Of Tipu Sultan – which is based on a novel (by Bhagwan S. Gidwani) of the same name, focuses on How Sheikh Fateh Mohammed handles the new responsibility given to him. In addition we also see how Tahir Khan (son of Abid Khan) started considering Sheikh his opponent, merely due to his jealousy. Sheikh was given the responsibility to collect the pending tax from Mir Akbarali Nayata. Mir Akbarali was a landlord of Balapur. Sheikh goes their with his men. It is informed to him that after so many reminders to pay the tax, Mir didn’t even care to respond Abid Khan, so collecting tax from him is a challenge. Sheikh decided to not to return till he got the tax collected from Mir. However when he reached Mir’s home, he found that only ladies are there including wife and daughter of Mir AkbarAli. Sheikh insist meeting Akbarali only, as he don’t want to discuss the stuff with the ladies. It is not that he considered ladies anyway less than men. He simply respected them and want to get them out of any problem. He also didn’t want to give them any tension. However as Akbar Ali was not and his wife (begumsahiba -as called by others) insist that she knows the reason of Sheikh’s coming there, Sheikh asked her to then do the needful. She demanded that the period for tax collection should be extended as per the request of Akbar Ali. But Sheikh asked that the requested additional period is also over and now he cannot do anything. So either she can arrange a meeting of Akbarali and Sheikh or can give him the money of tax collection, and he will leave immediately. But the lady confirmed that she cannot do either of thing. Which make Sheikh to take a decision to stay there, till either the money is given to him of meeting with Akbar Ali is arranged. Begum asked to be her guest and she will not treat them as Abid khan’s tax collector, but as the guest of Akbar Ali. This put Sheikh in a dilemma as if he accept the invitation he betray his duty or if he insist to do his duty, he may disrespect a well respected family. So the only thing he can do is either to collect the money or meet Akbar Ali personally, there is no third option. The lady then asked Sheikh that as Akbar Ali is not present, she cannot arrange his meeting with Sheikh, but if Sheikh thinks that Akbar Ali is there and hid himself somewhere in the house itself, he can run a search. Sheikh duly confirmed with her that it is she, who is inviting him to search her home, and Sheikh is bound to his duties, so he need to carry a search operation. The lady insists that performing the search is necessary to prove her truthfulness as well. See, these are the human qualities, a gentleman having all the powers, do not even think to cross the limit of respect for the ladies of a family, and a lady to support the truth, asks the gentleman to perform his duties. These are the kind of qualities which founds and strengthens the society. The search operation was unsuccessful as Mir Akbarali was nowhere there in the house. When the soldiers suggested to search the ladies’ room, with a possibility that Akbar Ali might be hidden there, Sheikh got angry. He insists that the respect of the ladies should be paid in any situation. And he strongly believe that Mir cannot go to that level to hid himself in ladies area. He then decided to question the people of village to find whereabouts of Mir AkbarAli. All the villagers decided to keep their mouth shut, but due to claims of forgery and stealing the property of others, which is wrong, a Maulvi (a pious man) drives Sheikh to the place where Mir AkbarAli was there….!!! Where was Mir AkbarAli? How can he capture the wealth of others and hide himself by not paying that collected tax to Abid Khan? He must be captured and met with justice right? The episode surely have some technical limitations and poor acting of some of the actors, but it focuses on human qualities and social bonding, which are enough reasons to watch the episode.